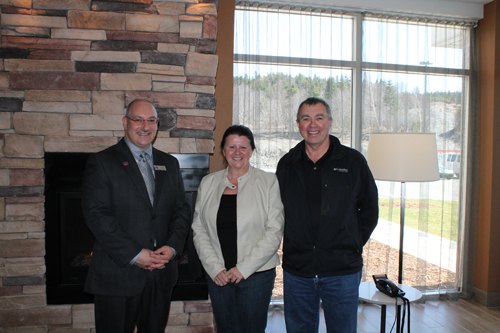 Cyril Russell, General Manager welcomes first guests, Harvey and Geraldine St. Croix! St. John’s, NFLD. May 7, 2013 – SilverBirch Hotels & Resorts today officially opens its doors to welcome guests to the new Fairfield Inn & Suites® by Marriott St. John’s Newfoundland, a hotel designed for guests to experience style, comfort and function in their leisure and business travel. Fairfield Inn & Suites® by Marriott St. John’s Newfoundland will provide guests with a hotel stay that combines small pleasures with all of the necessities, a signature that is consistent with their network of locations. Ideally situated between the St. John’s Airport and the downtown core, close to business parks, Memorial University, and the province’s largest shopping mall, guests of Fairfield Inn & Suites® by Marriott will appreciate the ease of this travel experience. Located at 199 Kenmount Road, the 148-room hotel provides guests with everything they need, including spacious guest rooms and suites equipped with microwaves and refrigerators, free WiFi and in-room high-speed internet access, enhanced work desks, ergonomically designed chairs, luxury bedding and complimentary hot breakfast. Guests will also enjoy five distraction-free meeting rooms and can unwind in the exercise room and pool, complete with a waterslide. Visit www.fairfieldinn.com/yytfi or call 1.855.823.6346.